Large projects frequently involve significant amounts of potentially biohazardous material. Biohazard contaminants left behind in the lab are a sizable danger. It’s critical to make sure your lab is clean and safe when the testing is done and you’re ready to move on to the next big project.. What is our real solution to this problem? The Whitney Medical Solutions' Biohazard Keeper - Floor Model. 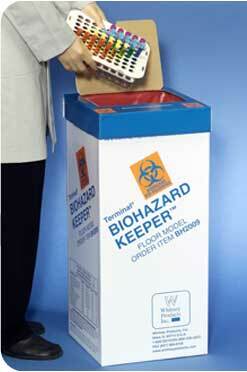 Collect and dispose of biohazardous lab waste conveniently and economically in the Biohazard Keeper Floor Model with its unique wide-mouth Reclose-A/ Remove-A-Lid™ cover. The ingenious cover allows you to reclose the container during use to reduce odors and mess, or you can remove the lid entirely. The wide-mouth opening allows you to dispose of large items, or entire racks of tubes or pipet tips at once. Biohazard Keeper - Floor Model’s sturdy corrugated construction offers strength, and the 2 mil red plastic liner provides leak-resistance. Dispose of non-sharp biohazardous lab waste, including petri dishes, tubes, plates, pipets and pipet tips, specimen cups, and tubing sets. Printed with orange biohazard symbols the carton’s warnings are printed in English and Spanish for added safety and convenience. When the container is full, a separate flap can be folded over the top to permanently close the container for final disposal. The Biohazard Keeper - Floor Model stores flat, conserving your storage space, and it can be easily assembled in seconds. CAUTION: Not a sharps container-do not use for disposal of contaminated sharps.